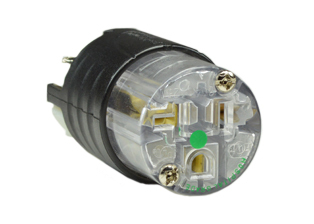 Hospital Grade | Green Dot | Power Cords Cord Sets | Medical Grade Plugs Connectors & Outlets | International Configurations, Inc.
International Configurations North American and Canada hospital grade power cords are available at our link Hospital Grade Power Cords | Green Dot. 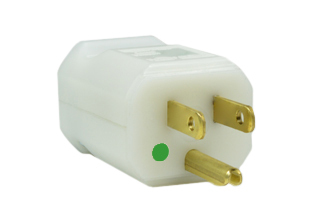 Hospital grade Green Dot marked power cords are manufactured in various lengths and plug color options. 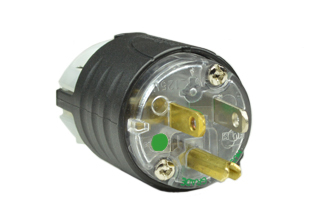 NEMA 5-15, NEMA 5-20, NEMA 6-15 and NEMA 6-20 hospital grade plug configurations on these power cords are available in colors gray, black, clear and white. Standard Hospital grade power cable cordage colors are gray, black and white. 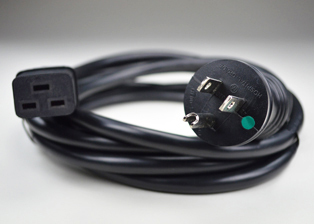 These hospital grade power cords are produced with detachable IEC 60320 C-13 and detachable IEC 60320 C-19 molded on connector ends or can be supplied with open ended ROJ wire ends for direct hard wiring to equipment. 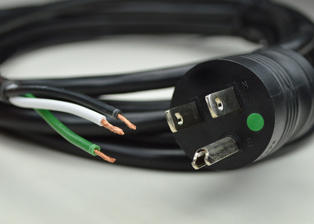 Hospital Grade power cords sometimes referred to as Medical Grade power cords carry a Green Dot mark signifying high quality durable electrical contacts. 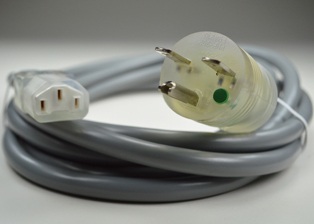 These medical grade power cords are constructed with solid blades and double insulated inserts for durability and user safety in medical settings. Select Medical Grade power cords and cables at this link Medical Grade Power Cords| Green Dot. 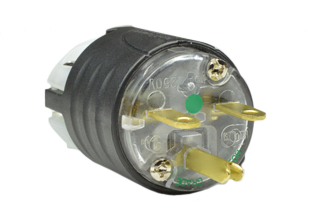 Our green dot hospital grade power cords carry UL & CSA approvals and meet applicable agency and testing requirements to UL817 and CSA C22.2 No. 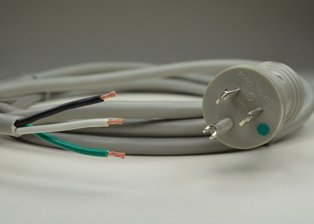 21-95 for use in hospitals, clinics, institutions and medical facilities that need high quality durable medical and hospital grade power cords. 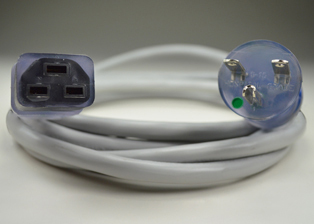 Summary; Hospital grade power cords by International Configurations Inc. are approved and certified for use in medical clinics, medical institutions, medical centers, medical facilities, on hospital equipment, in hospital medical settings and medical or hospital work stations that require medical grade quality and compliance when using hospital and medical grade power cords. 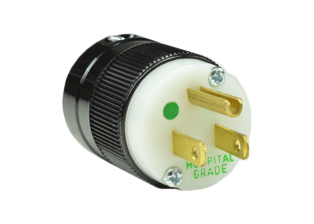 Molded hospital grade plugs used in the construction of hospital grade power cords are tested and pass the following criteria. 1.) 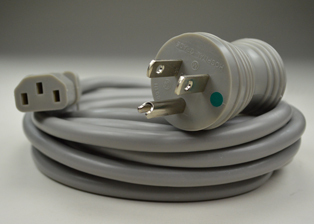 Appearance: Overall appearance of the hospital grade power cord. 2.) 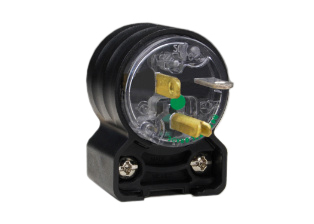 Marking: Hospital grade Green Dot marking, Hospital grade UL marking and amps and volts electrical ratings. 3.) Hospital grade plug Insulation Resistance: Min 100MΩ at 500V DC/1minute. 4.) 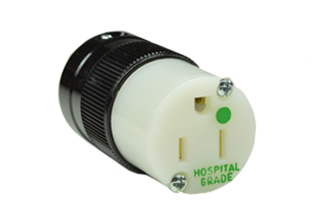 Hospital grade plug Electric strength: No flash and broken on hospital grade plug jacket and insulation during 2000V AC/1minute. 5.) Temperature Rise to hospital grade requirements: Accessories shall be so constructed that the temperature rise shall not exceed 30K. Test current :Varies Duration:1H. 6.) 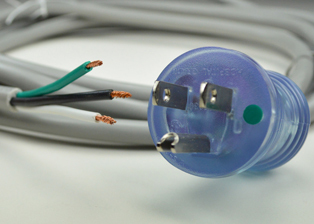 Hospital grade plug strain relief tests: Each of six representative hospital grade attachment plugs molded onto flexible cord, without the conductors terminated to the blades or grounding pin, shall be subjected to a rotary cord motion while a force of 10 lbf (44.5 N) is applied for 2 hours. The cord is to be rotated at a rate of approximately 9 r/min in a 3 inch diameter (76 mm) circle at a point 6 inches (152 mm) below the cord exit with the hospital grade attachment plug rigidly mounted.After being subjected to the strain relief tests described in this section, there shall not be any displacement of the conductors, conductor insulation, or outer jacket of the flexible cord exceeding 1/32inch (0.8 mm). 7.) Hospital grade plug blade pull test at elevated temperature: Each hospital grade attachment plug is then to be securely mounted so that the line blades are positioned downward through a circular hole in a 1/4 inch (6.4 mm) thick steel plate mounted horizontally within an air circulating oven that has been heated to 60°C (140°F). After the fittings have been positioned, a weight that exerts 10 lbf (44.5 N) is to be attached to each of the individual hospital grade plug head line blades. The oven is then to be maintained at 60°C (140°F) for 4 hours after which the weights are to be removed and the hospital grade attachment plugs or current taps taken from the oven and allowed to cool to room temperature. Each hospital grade plug blade shall be used to determine compliance with the 1/16 inch (1.6 mm) maximum displacement requirement. 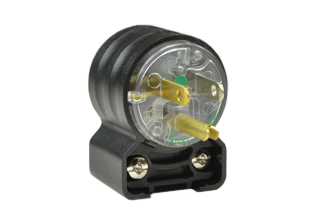 Cordage molded molded hospital grade power plugs are tested and pass the following criteria. 1.) Marking: UL marking, temperature rating, voltage rating, jacket material specified, conductor size. 2.) Diameter of cord: Hospital grade power cord cordage diameter within parameters. 3.) Cordage thickness test: Core test and jacket test both meet hospital grade compliance. 4.) Physical properties of insulation unpaged: Before aging,the elongation of insulation shall be not less than 100%.The tensile strength of the insulation shall be not less than 10.34N/mm2. 5.) Physical properties of insulation after aged: At temperature of 136±20°C for 168 hours,the elongation of insulation shall be not less than un-aged 65%.The tensile strength of the insulation shall be not less than un-aged 85%. 6.) Physical properties of jacket unpaged: Before aging,the elongation of jacket shall be not less than 100%.The tensile strength of the jacket shall be not less than 10.34N/mm2. 7.) Physical properties of jacket after aged: At temperature of 136±20°C for 168 hours,the elongation of jacket shall be not less than un-aged 65%.The tensile strength of the jacket shall be not less than un-aged 85%. 8.) Flame test: After five 15-s applications of a standard test flame. Where any specimen shows more than 25 percent of the indicator flag burned away or char. 9.) Cord bend: The specimen shall not show any cracks on the surface when the mandrel after subjected to temperature of -20±2°C×4 hour. No Crack. 10.) Conductor resistance: The resistance of conductor shall be not over 22.4Ω/KM at 20°C. 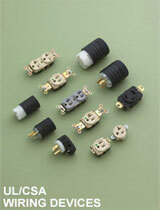 International Configurations North American and Canada hospital grade power attachment plugs meet cUL. Hospital grade attachment power connectors meet cULus and wall box or panel mount hospital grade power outlet receptacles meet UL498. Hospital grade attachment plugs and connectors are made with a corrosion and impact resistant nylon material for the body shell with Heavy-duty internal brass alloy blades and contacts. Wall mount or panel mount hospital grade receptacles and outlets are produced with a Corrosion-resistant plated steel strap, Impact-resistant nylon face and thermoplastic back body containing the Heavy-duty internal brass alloy contacts. 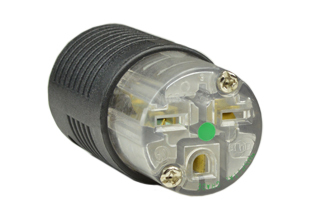 View hospital grade plugs and connectors at the link Hospital Grade Plugs and Connectors | Green Dot. 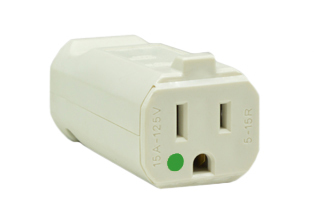 View hospital grade receptacles and outlets at the link Hospital Grade Receptacles and Outlets | Green Dot. Summary; Hospital grade wiring devices by International Configurations Inc. are approved and certified for use in medical clinics, medical institutions, medical centers, medical facilities, on hospital equipment, in hospital medical settings and medical or hospital work stations that require medical grade quality and compliance to hospital requirements and standards.